Bert Carson - writer: SoundCloud And Me! - SoundCloud And You? I just discovered a new world, and I wasn't even looking for one. All I intended to do was find a way occasionally to put an audio clip in a blog post. I did that. I found a great, easy, and beautiful way to do it. In case you missed the how-to of it, the whole story is here. However, this blog is about the new world I found when I wasn't looking for one. That's not an original line. In fact, it's my understanding that line, verbatim, was first recorded by Christopher Columbus in his private Moleskine journal. Actually the new world I found is connected to and expanded from an old world I once lived in. A world almost, but not quite, lost in the haze of seventy years. one, the one that has been left in the haze. Before I was born, there were console radios in the living rooms at both my grandparent's homes. And, yes, everyone did sit, and lay around in the living room and listen to the world being beamed to us from places much further away than downtown Birmingham, Alabama. And when I joined the group, I shared in their radio time. 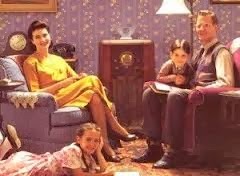 Now, looking through the filter of all those hazy years that separate me and those radios, I realize that, for my grandparents and parents, the radio experience was far different than it was for me and my cousins. The adults knew the radio was just the first of an infinite number of gadgets that would bring them nearer and nearer the final manifestation of the promise of the American they had pursued through two wars and all the years of their lives. For us kids it was something entirely different. It was the world coming to our home to introduce itself and give us our best chance to learn more about this place we now found ourselves in. Then television arrived. It's not my intention to pound the obvious, however, allow an observation—note the radio folks (in the first illustration) are focused on the person snapping their picture (no doubt one of their grandparents), then note the focus of attention of the television folks (in the second illustration). 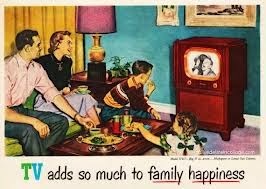 My point is, with the introduction of television, our focus shifted from each other to a gadget. So, what does that have to do with finding a new a world? Everything. The "new world" I've found, by the way, isn't new. In fact, it just turned five years old. But its new for me since I just found it. And, get this, it's about people sharing what they do. It not only brings the world to you, like the old radios did. The new world gives you the opportunity to interact with the world, and you can even share with those who are sharing with you. Now the word of SoundCloud is yours. Enjoy.